Mulch is a significant and routine investment for any landscaper. At Wales Station Nursery and Big Creek Landscaping we want to make sure that you know what to look for and what questions to ask before you buy your season’s supply. 1) Is the mulch manufactured from new or seasoned wood materials? New wood materials are soaked in sewage material (often referred to as ‘greenwaste’to enhance the decomposition process. Some sellers will tell you it works as a fertilizer. This sewage soaking will give the mulch that distinctive yukky odor. AND, this process also brings some nasty disease potential to the ground and plants around which you may be spreading it! This natural aging process eliminates any need to add ‘greenwaste’. The aged wood is then ground and is free from the nasty smell you may associate with mulch. 2) Why does mulch grow fungus? Mulch that has been soaked in ‘greenwaste’ or sewage material is prone to growing fungi and can and does bring contaminants and diseases that kill plants and pollute your soil. 3) What is the process for making colored mulch? Many manufacturers will sift coal ash into mulch to create the color effect. These mulch products not only lose their color with each rainfall as the chalk washes off, but the process of spreading the mulch is messy as the color rubs off on your hands and clothing. 4) Chunky vs. Finely Ground? Mulch that has been soaked in “greenwaste” is often very finely ground. This can create a barrier to water being able to seep into the ground with rain or irrigation and leaves the top layer constantly soggy. Soggy mulch is a good breeding ground for insects along with fungus and other diseases. 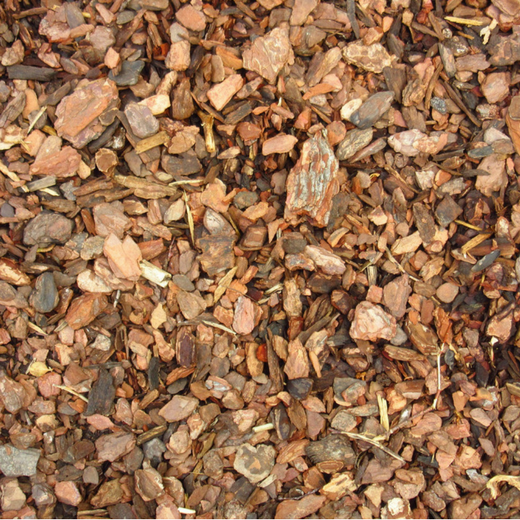 Select mulch that is shredded with land covering AND landscape design in mind. Its size allows water to seep to the ground and provides good cover to keep moisture in the soil while allowing the mulch to dry out.